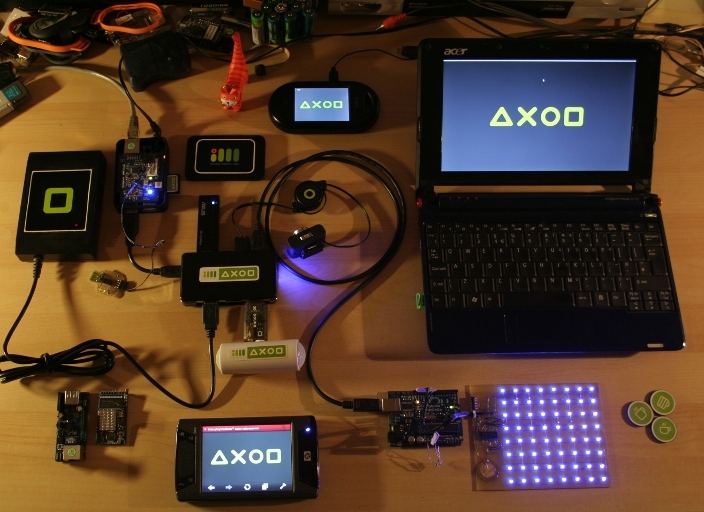 Axod is a Lua based microserver intended to organize the customized local interactive spaces. The Axod was initially developed for use on embedded devices running an OpenWRT Linux that is proposed as alternative firmware for mass-production network routers. At the moment you can use practically any hardware with any Linux distro in accordance with the scale of your project. This is an nice platform for independent Interplay Medium developers. Click below to see project details and tutorials for developers. audible: in the base configuration is implemented an easy-to-use music player that helps to transform your device into a music center. A user-friendly interface controls the music output (play/stop) and provides the functionality to sort the track list by several parameters, move around subdirectories and add radio stations to the playlists. All synapses are supplied with the html interface that is viewable in a browser at pocket or stationary device. The device has to have a local network connection provided by your AXOD microserver). This allows you to control your local interactive space directly from your pocket device. An AXOD device can be used to control your local interactive space or part of it, as well as work within a cluster of other AXOD devices. As a designer you can use AXOD as a high-level (or mixed-level) external interface to your im-objects. Also you can easily modify and extend the synaptic groups with your own interfaces and easily broaden the functional potential of your AXOD device. Привет Дима! Сразу про тебя вспомнил, может будет интересно посмотреть – http://www.youtube.com/watch?v=XEe3dYBj7RE the android adk platform. All visual materials on this website published under a Creative Commons Attribution-NonCommercial-ShareAlike 3.0 Unported License. (cc) 2008-2019. Powered by WordPress.